Common experiences after your first event include not sighting the right buoy, not sighting enough, drafting off others who were swimming off course or being pushed by the current. Before a swimmer tackles open water swimming, it is important to address feelings of anxiety in the pool. Fear and lack of comfort with basic skills can often be the first obstacles to a successful swim. There are many techniques that you can practice in the pool which will help prepare you for open water swimming. 1. Learning to float and improve your balance and stroke technique in the pool. 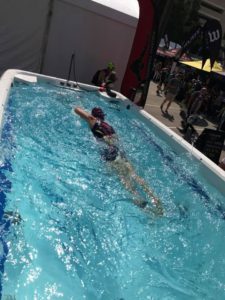 Working on these techniques will result in a smoother swim and less energy expenditure and conserve your energy on race day. 2. Practice swimming without goggles. During a mass swim start, your goggles might get knocked off. You can prepare for the pool by practicing treading water or floating while taking your goggles on and off. 3. Simulate swimming close to others. Gather your friends in one lane, each with one hand on the wall. Then push off at the same time and race across the length of the pool while pulling on each other’s legs and swimming on top of each other. 4. Simulate the lower visibility by swimming the length of a pool with your eyes closed. If possible, you should also try to do it without lane markers. 5. Don’t wait till your first race to try on your wetsuit, even if you wore it last year. Many athletes find wetsuits uncomfortable and constricting, especially around the chest when breathing. If you are experienced, you should still prepare for race day warm-up, sighting the buoy, drafting, and going from a horizontal to vertical position. If the race venue allows, warm up for at least 10 minutes before your wave starts. This includes getting in and out of the water 4 times to acclimate to the temperature. The conditions and temperature of the water can cause your heart rate and breathe to increase if not properly warmed up. A technique to site the buoy is called “alligator eyes“. While you are swimming, lift your chin so your goggles clear the water and you are looking forward while exhaling. During this time, site the buoy and then turn your head to the side and inhale like you normally do in the pool. It is important to sight frequently as accurate sighting can save you time and energy. A newbie should also consider lining up on the outside edge of their wave to get a clearer view of the water ahead. When the gun goes off, wait a few seconds before you start so that more experienced athletes are less likely to run into you when they begin. Open water swimming can cause a psychological barrier for athletes, especially newbies. Lower visibility, the stress of cold water, swimming close to others, no lane lines, and no floor or walls to rest on, often leads to anxiety. To mentally prepare yourself, before you get in, assess your surrounding and consider the conditions you are likely to face. Each time your practice swimming in open water, you will achieve a different experience to take with you on race day.